A $2.4 billion merger between two powerhouses in the home health field is expected to create a new industry giant and set in motion significant long-term consequences for the home health field, according to Home Health Solutions Owner and President J’non Griffin. In a deal set to close in 2018, Kentucky-based Almost Family, Inc., and Louisiana-based LHC Group, Inc, have announced their plans for an all-stock merger of equals, creating a company with a starting roster of more than 30,000 employees nationwide. “This merger is a huge development, with the potential to shore up confidence in the future of home health, impact stocks and rejuvenate an industry feeling the weight of an increasing regulatory burden,” J’non said. But she warns that the move could have some negative consequences – especially for smaller agencies. “The new company created by this merger will be poised to set the professional tone and standards in the entire industry regarding delivery of well-coordinated, patient-centered care,” J’non said. “Smaller agencies struggling to meet quality expectations may find it increasingly hard to compete in the evolving marketplace. Coupled with increasing regulations, the evolution of a faster-paced, coordination-intensive market with much bigger players could squeeze some smaller, struggling agencies into selling or going out of business,“ she added. The merger between LHC and Almost Family reflects a dramatically shifting turf in the industry, as agencies increasingly look at strategic partnerships, joint ventures and other consolidation efforts to buffer the challenges presented by mounting regulatory burdens. So far this year, LHC Group had acquired more than 35 home health, hospice or community-based locations, as well as six long-term acute care hospital operations, before it announced plans for the merger with Almost Family. Next year is shaping up to be a transformative year in many ways for the home health field, according to J’non. In January, agencies will implement new Conditions of Participation set by the Centers for Medicare and Medicaid Services (CMS), requiring extensive operational, administrative and clinical changes. “Meeting the demands of the new CoPs is expected to be a watershed moment for some agencies which have been struggling to stay afloat under the compliance burden, and simply may not be able to adapt quickly enough to the new round of regulations,” she said. In addition to new CoPs requirements, agencies throughout the country are expected to be required to transition soon to the value-based reimbursement model already under demonstration in nine states. Officials at Almost Family and LHC have made no bones about positioning the giant company created by the merger to become the industry leader in value-based reimbursement. Although a value-based purchasing model is only active in nine states right now, many home health experts believe CMS may have recently signaled its readiness to soon expand VBP to all other states. The VBP model has largely been considered a success because the nine states participating in the demonstration have seen improvements in outcomes at a faster rate than states which were not included in the program, J’non said. Look for this picture on the Home Health Solutions Facebook Page every day during our 10-day Countdown to Emergency Preparedness and comment to win helpful EP products! TIP #3: WAIT. A FULL-SCALE DRILL BY WHEN? 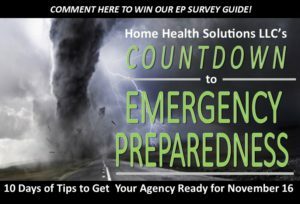 Are you still working hard to get your home health agency’s new Emergency Preparedness Program in place by November so that you can meet the CMS deadline and begin all the detailed planning for those two exercises you’re required to stage — the full-scale community disaster drill and a second, smaller-scale table-top exercise? For compliance, your agency will need to have already staged both these required exercises by November. The Emergency Preparedness Requirements Final Rule was posted to the Federal Register more than a year ago, on Sept. 8, 2016, and the regulation went into effect just two months later, on Nov. 16, 2016. Medicare and Medicaid Participating Providers and Suppliers were given one year from the effective date to comply and implement all regulations. When that year is up – in just one more month – home health agencies will be subject to citations for non-compliance if they have not yet staged both exercises this past year. The Emergency Preparedness Requirement was confusing to many home health agencies. We talk to agencies every day who are so busy caring for patients and taking care of agency business that they have trouble juggling regulatory deadlines – especially this year, when the start date for new Conditions of Participation was originally set for a July implementation, and then delayed until January. Isn’t the Emergency Preparedness requirement part of the new CoPs, agencies ask us. Don’t we have until January now? Not for your Emergency Preparedness Programs, we explain. While the Emergency Preparedness requirement is included as part of the new CoPs, and while the start date for CoPs was pushed back six months, a delay was never granted for the original Emergency Preparedness Requirements Final Rule which posted to the Federal Register back in 2016. The clock began ticking then. Some agencies which experienced actual emergencies this year may be exempt from the community-wide disaster drill (please see Tuesday’s Tip #2). But agencies which did not activate emergency plans this year and conduct an evaluation afterward are expected to comply with the full-scale community-wide drill prior to next month’s deadline. In either case, agencies also will be expected to have staged tabletop exercises, in which mock disasters are conducted via paper. 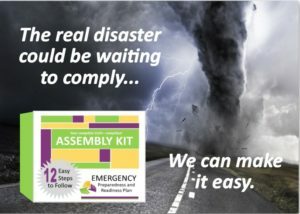 If you’re feeling panicked by the approaching deadline, please visit our online store today and check out our 12-step Emergency Preparedness Plan Assembly Kit. We’re not going to mislead you; it’s getting late in the game to comply, and it will be very difficult now to meet the deadline if you have not yet begun. But don’t wait another day. Our Kit will make it faster and easier. Click here to visit The Solutions Shop, our online store. Has your home health agency been waiting on Interpretive Guidelines for new Medicare Conditions of Participation before beginning work on an Emergency Preparedness Program? Then it’s time to roll up your sleeves and dive into identifying the specific hazardous situations your agency could face, develop emergency communication strategies for emergency conditions, and create the training and testing procedures which must be in place by November. Interpretive Guidelines have been released by the Centers for Medicare and Medicaid Services (CMS), specifying what Surveyors will look for after Nov. 15 as they try to determine how well agencies have prepared to address the needs of homebound patients in the event of manmade or natural disasters. The real impact of the release of the Interpretive Guidelines is that agencies may now believe they have a “green light” to go forward with work on their plans, J’non said. “Even though CMS has encouraged agencies to avoid waiting on the release of the Guidelines to get started on their Emergency Plans or risk being cited for non-compliance in November, some agencies felt that until the Guidelines were in place, there was no real sense of urgency,” she said. “Now we are just five months away, and there’s no more time left to delay,” J’non said. She said it will take some time for agencies to effectively coordinate efforts with strategic community partners to plan and stage the community-wide disaster drill which is an important part of the CoPs requirement. Surveyors will review records to look for some specific items, including evidence that the agency has met a new Condition of Participation requiring an individual emergency plan for each patient as part of the comprehensive assessment. They’ll look for documentation showing that agency personnel discussed emergency procedures with patients and caregivers. Agencies will need written policies and procedures detailing how emergencies will be handled. Surveyors will be especially interested in seeing written procedures for how agencies will inform state and local officials about patients who may need evacuation from their residences. It is also like that Surveyors will interview agency leaders and/or staff members to determine how knowledgeable they are about procedures to be followed in an emergency situation. Our 12-step Emergency Preparedness Plan Assembly Kit makes compliance easy for your agency. We break down the complicated process into easy-to-follow steps, show you what a completed Plan should look like, and provide more than 30 forms and tools designed to capture all the information you’ll need to put together your own plan – even the training materials and evaluation forms to meet the testing/training requirement. Our Kit provides the full written policies and procedures your agency will be required to have — and now that the Interpretive Guidelines have been released, we are adding tips on what Surveyors will want to see. Click here to visit The Solutions Shop, our online store, and order the Kit today! An effective staff training program is one important part of the Infection Control Program mandated for home health agencies under new Conditions of Participation in Medicare. 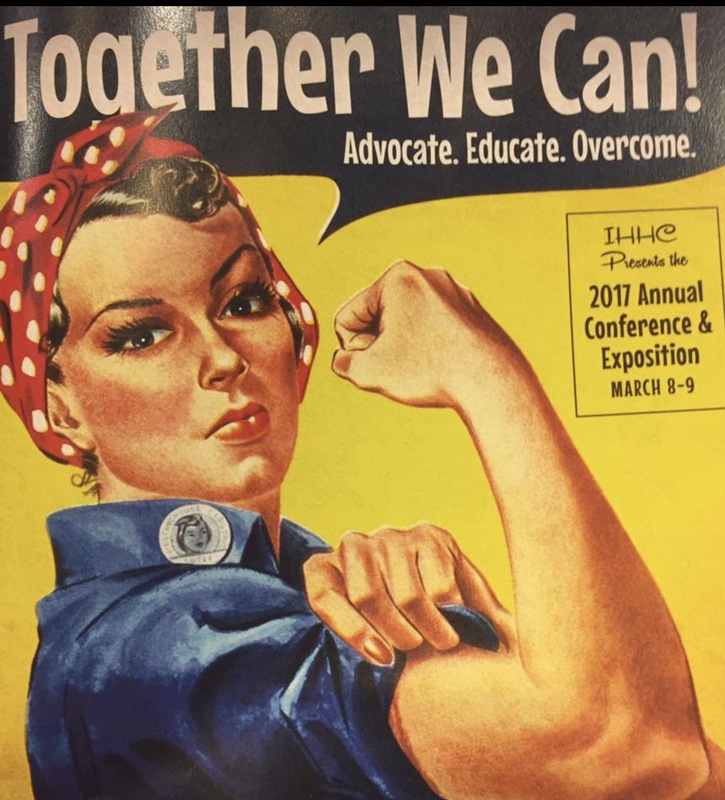 “Many accreditation programs already require home health agencies to have in place Infection Control Programs, but under new CoPs all agencies participating in Medicare will need to have specific programs focusing on prevention, control and ongoing education for both patients and staff, ” says J’non Griffin, owner of Home Health Solutions, LLC. J’non is conducting CoPs training workshops across the country to help agencies prepare to meet the new regulations, including three full-day workshops this week in Tampa, Orlando and Ft. Lauderdale. Here’s her 6-point outline for setting up a CoPs-compliant staff training program at your agency. IDENTIFY YOUR AGENCY’S SPECIFIC RISKS. While there are some standard risks that every home health agency must address when developing an effective infection prevention and control program – influenza and tuberculosis, for example — it’s important for your agency to exercise some diligence in determining risks which may be specific to your geographical area, or to your patient population. Some areas of the country experience a higher incidence of HIV, for example. Elderly populations may have less resistance to certain bacterial infections. State health departments should have statistics for your area, many times online. But you can also start with a call to your local public health department to glean statistics that can help you identify infection risks specific to your agency. Document the results of your risk identification efforts, and provide specific training to your staff in each of the areas identified, as well as measures to control the spread of communicable and infectious diseases commonly occurring. MAKE INFECTION CONTROL TRAINING PART OF YOUR AGENCY’S ORIENTATION. There’s a lot of ground to cover with each of your new hires, but don’t neglect to include infection control measures in your orientation program. Implement a “See No Clients Until” rule at your agency precluding any staff member from making a home visit until infection prevention and control training has been received. DEVOTE ENOUGH TIME TO TRAINING. Because many of the elements of an effective infection control program seem simple and obvious — including basic hand hygiene, protective nursing bag techniques, and exercising care with IV, catheter and gastric tube changes — it can be tempting for busy home health agencies to discount the importance of training. Be careful not to shortchange your training sessions. Devote at least a full hour to each session, and make certain each of your employees receives a full hour of training no less frequently than once a year. Your agency should be able to show Surveyors at a glance who in your agency has received training in infection prevention and control, when the training occurred, which topics were covered, and who presented the training. You should also be able to easily identify staff members due for another round of training. Infection control and prevention measures should be addressed in training sessions that occur at least every 12 months. Make certain that your records include forms signed by all staff members attesting to attendance in training sessions – and that the staff member understood the material covered in the session. EVALUATE AND UPDATE YOUR TRAINING PROGRAM AT LEAST ANNUALLY. Self-evaluation is a consistent theme found throughout new Conditions of Participation. CMS wants to see evidence that your agency is monitoring its own efforts and addressing any shortcomings. Make certain that you apply this self-testing approach to staff training as well as all other aspects of your operation. Are all your employees up to date on their training? Have you have an outbreak of an infectious disease among staff members since your last evaluation – and if so, how well were you able to control it? Do staff members need additional training to address deficiencies? Are you checking frequently with state or local public health authorities for current information and updating your agency’s risk assessment accordingly? Offer staff training in any new areas of risk identified. Home Health Solutions can help your agency with its implementation of an effective Infection Control program in several ways. One of the most important elements of creating your program is the development of policies and procedures outlining your program’s scope and how it will be implemented. We’ve covered that in our Policies and Procedures Manual, one of two CoPs-compliant manuals ready for your agency to purchase and customize. You can also read more about the development of your agency’s Infection Control program in Volume III of our CoPs COMPANION series of four guidebooks designed to walk you through the transition to new CoPs. Check out both these products in our online store by clicking here. Last month’s reprieve from continuing pre-claim review demonstrations by the Center for Medicare and Medicaid Services and the announcement that CMS is considering a delay in the start date for new Conditions of Participation has created a sense of cautious relief in the home health field. Many home health professionals are wondering if the reprieves and delays reflect a trend away from increasingly stringent compliance demands on home health agencies in recent years. But gambling on the advent of a more relaxed regulatory climate could have negative consequences for agencies – including CMS citations for non-compliance beginning in November for agencies failing to meet new Emergency Preparedness Program requirements, warned J’non Griffin, president and owner of Home Health Solutions LLC. A proposal CMS is now considering to push back the start date for revised Conditions of Participation is not expected to impact the Nov. 15 effective date for Emergency Preparedness Programs. “This means that regardless of whether CoPs are implemented on July 13, 2017, or pushed back six months until January, 2018, home health agencies will need to have in place their Emergency Preparedness Programs by this November,” J’non said. To avoid non-compliance, beginning Nov. 15, agencies will need to have already conducted the community-wide disaster drills which are part of the CMS-mandated Emergency Preparedness Programs. This requirement has been one of the most intimidating to many agencies, according to J’non, because it requires them to pool efforts with local and state emergency agencies and health care coalitions to conduct full-scale community exercises. Under the Final Rule mandating home health Emergency Preparedness Programs, two of these drills are required annually for agencies to test their emergency operations, although one of the drills may be a tabletop exercise. Agencies experiencing real emergencies may be excused from one of the required yearly drills. Some agencies have not yet begun efforts to coordinate the disaster drills because they are hoping additional guidance will be provided when interpretive guidelines for the new CoPs are issued. “Agencies really shouldn’t wait for interpretive guidelines to be issued. CMS has specifically addressed this issue, stating that agencies must perform their community wide disaster drills by Nov. 15,” J’non said. Agencies unable to conduct a community-based exercise by the deadline may be able to document why and avoid citation for non-compliance as long as reasons are valid, J’non said. In rural areas, for example, agencies may not have access to the same resources as agencies in more populated areas. In a community in which an annual disaster drill is already scheduled to take place after the Nov. 15 deadline, it may make more sense for an agency to wait and join existing community efforts. Agencies who find themselves in these or other situations which hinder efforts to comply with the disaster drill mandate must thoroughly document efforts to coordinate a community wide drill, explaining why it was not possible within the time frame, according to J’non. They will still need to conduct and document a facility-based disaster drill, she said. 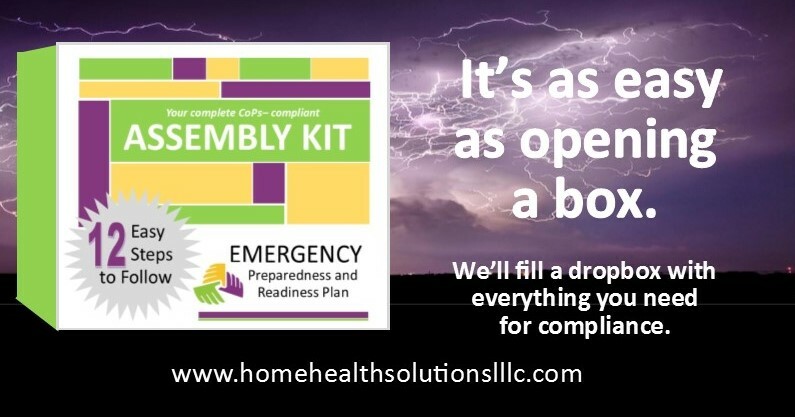 Home Health Solutions offers an Assembly Kit that breaks down the development of an Emergency Preparedness Program into 12 easy-to-follow steps, offers a Sample Plan to follow, and provides more than 30 assessment tools and forms which will be needed to capture the right information for creating a fully compliant Emergency Preparedness Program. It’s designed to simplify the process for busy agency executives with a format anyone can easily follow to meet CMS requirements. Yes, there is a possibility that the federal Center for Medicare and Medicaid Services will delay the implementation of revised Conditions of Participation, allowing home health agencies extra time to make the many clinical, organizational and administrative changes which will be required. The bad news is that a possible delay doesn’t mean agencies can afford to wait to begin working on meeting the new requirements. 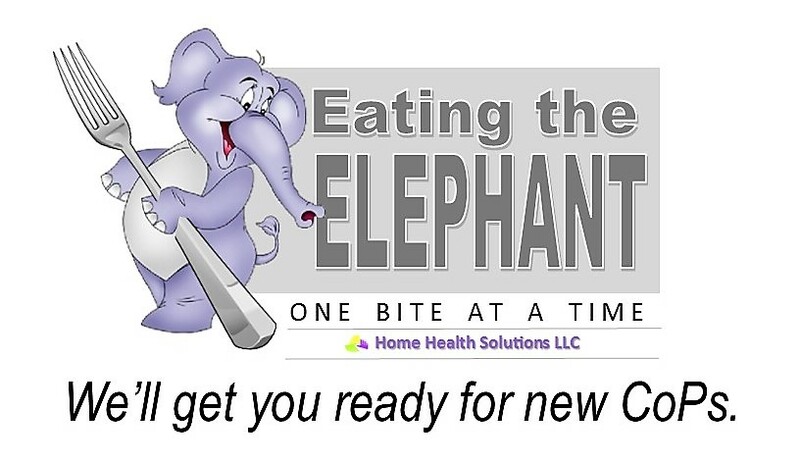 In fact, Home Health Solutions Owner and President J’non Griffin advises home health agencies to move forward with all changes as if there will be no change in the effective date established under current law. The need to begin work now on the many changes required under CoPs is especially true for creating Emergency Preparedness Plans, which will likely be one of the more labor-intensive and intimidating new requirements for agencies, J’non said. Conditions of Participation will require home health agencies to have in place a detailed Emergency Preparedness Plan including hazard risk assessments for their specific communities, communication plans for any natural or man-made disaster and many other specific components. Under the Final Rule approved in January, agencies have until November 2017 to put together this complex Emergency Preparation Plan, and have in place measures for conducting community-coordinated disaster drills to practice how they would handle their patients and work with other facilities during an actual emergency situation. In addition, the agency’s emergency preparedness program will need to include individual plans for its patients. Last week’s announcement by CMS that it will consider a delayed start date for CoPs, pushing the current effective date from July 13 2017 to January 13 2018 made no mention of a new time frame for the Emergency Preparedness Plan requirement. Until otherwise notified, agencies must assume that the November 2017 deadline stands, according to Home Health Solutions LLC Owner and President J’non Griffin. There is no guarantee that CMS will approve any delays, despite last week’s announcement, and agencies could be risking non-compliance if they do not move forward with changes, J’non said. Need help with your Emergency Plan? A complete Emergency Preparedness Plan Assembly Kit is one of the resources and products Home Health Solutions has created to help agencies meet the new CoPs. The Assembly Kit and other products are featured in our new CoPs Success Catalog. Click here to see the catalog now. You’ll find all the tools you need to meet the new CoPs in our catalog. 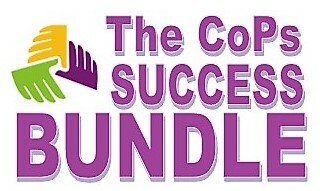 And with our CoPs Success Bundle, you can buy EVERYTHING you need for success at one great price, without having to spend the time to pick and choose. We’ve done all the work for you! EDITOR’S NOTE: This article first appeared in the March 1 issue of The Absolute Agency, a free best practices resource emailed to agency administrators each month. To subscribe, click here. It’s been almost 30 years since CMS changed the rules for home health agencies participating in Medicare, but the summer of 2017 will usher in both small and large changes in operational aspects of home health care. Agencies must be prepared by July to meet most of the newly revised Conditions of Participation, although emergency preparedness plans won’t have to be in place until November. 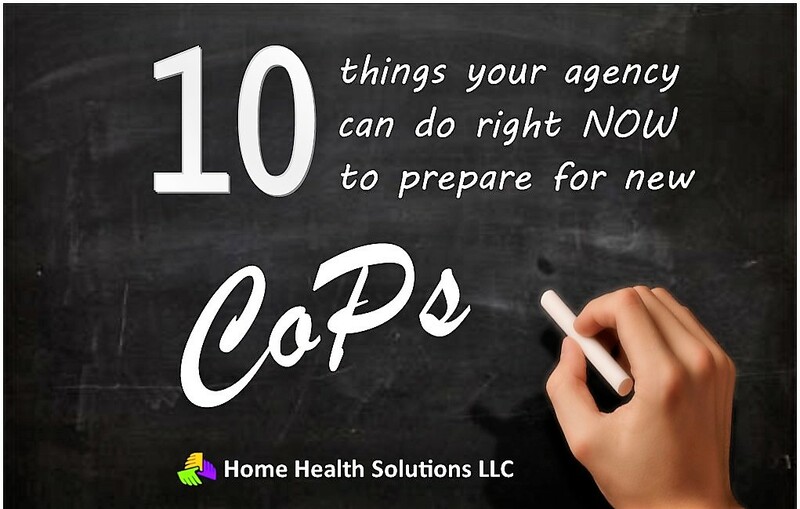 Home Health Solutions will be focusing in greater detail on these and other aspects of the revised CoPs during the next few months, but there’s no need to wait to get your agency ready for the changes. Here’s our To-Do List of 10 simple tweaks, small changes and easy projects you can do right now to prepare for July and get ahead of the game. 1. Create An Organizational Chart. If your agency doesn’t have one, start one. Establish a clear chain of command. Already have an organizational chart? Great! Make sure that it has a Clinical Manager who is responsible for making assignments, coordinating patient care and performing many of the functions currently falling under the duties of a Supervising Nurse. Having a Clinical Manager is one of the new CoP requirements. This doesn’t have to be one person. It’s OK to have more than one Clinical Manager on your chart. Neither will your Clinical Manager have to be an R.N. Under new CoPs, the professional in this role may be nurse, therapist, social worker, even a doctor. Your organizational chart will need to be in writing, along with all other agency policies. 2. Create or Review Existing Job Descriptions. You’ll need a job description in writing for each person who works at your agency – and the job description will need to include licensing requirements as applicable for specific positions. This will vary from state to state, so resist the urge to copy a great job description from an agency in another state. You’ll have to make sure you do your homework so that your job descriptions are unique to your agency and match your state’s requirements. Make certain, in the case of your Clinical Manager, that the job description highlights the primary responsibility as COORDINATION of services, patient care, etc. Now make it a habit. There’s no time like the present to start cultivating a new habit, and your entire staff is going to need to become much more time-conscious under new CoPs. Clinicians will need to get into the habit of including the TIME in all visit notes. There’s new wording in the CoPs, and it’s all about what time it is: time of arrival, time of departure, time that a service was provided, and what time it was when someone on your staff spoke to a physician. It’s no longer enough to record the date on which an order was received; you’ll need to record the time, too. Give your staff plenty of time to get into the habit; start requiring the documentation of time today. 4. Start collecting phone numbers and contact info. While you’re adding the list of numbers and contact info to the patient rights and information packets you provide to your patients at Start of Care, spend some time reviewing and evaluating exactly what you’re handing out and how well it is organized. Is it easy to understand? Can you edit or rewrite any portion of it to make it simpler or any clearer? Does it spell out clearly how a patient, caregiver or representative is to report a problem or file a complaint – and to whom? Under new CoPs, you’ll need to make sure to provide the patient with the name, phone number and contact information for both the agency administrator and clinical manager. Make sure to include in writing your agency’s transfer and discharge policies. New CoPs will require you to provide this information to patients. There are many other new patient rights requirements, too, but working now on these particular elements now can put your agency ahead of the curve. 6. Take steps to erase language barriers. Make certain your agency can easily provide interpreters and copies of patients rights and information in the native language of the patient. Even if your agency does not currently serve patients who speak a language other than English, you must be prepared to overcome language barriers in the event that such a patient needs your care. Start developing a plan now for securing interpreters as needed, and draft a written policy addressing how your agency will handle this situation should it occur. Make sure you are conducting a review of all meds the patient is currently using and perform a reconciliation. Clinicians are already asked to do this as part of OASIS, but under new CoPs, your agency will be required to review all medications a patient is taking — including those prescribed by other care providers — to identify, review and resolve any discrepancies. Work on getting faster in every aspect of your agency’s operation. Tighten your deadlines and stress to your staff the importance of streamlining and expediting paperwork. Under new CoPs, you’ll need to have summaries prepared much faster, meet expedited turnaround times, be able to provide complete information to patients by the next home visit upon request, and follow through on discharged patients within a 5 business day window, providing a discharge summary to the agency, physician or other entity into whose care the patient is being transferred. 9. Take a new look at how to safeguard private health information. Under new CoPs, you’ll need a detailed written policy establishing procedures to be followed in the event of loss, theft or destruction in any manner of a computer on which private medical records are stored. This is a good time to start detailing that policy. 10. Start working on your agency’s Emergency Preparedness Plan. Agencies have until November to get together the detailed Emergency Preparedness Plan required by new CoPs – but this is a complex undertaking with many components, and getting started today is the best course of action. Start by calling your local Emergency Preparedness Agency today to set up a time to meet with a representative who can help you with one of the most intimidating pieces of this project for many agencies: the coordination of communitywide resources and other facilities. 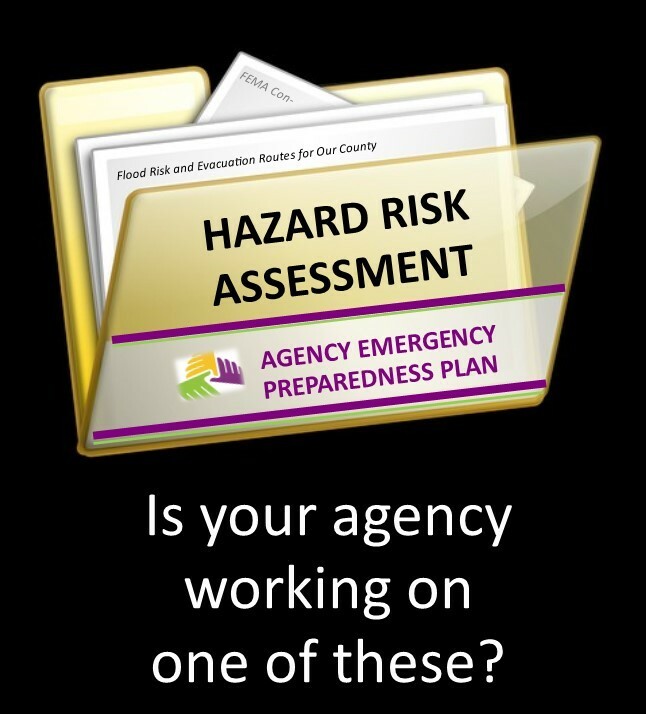 FEMA already has access to much of the information you will need for your plan, including detailed studies and existing coordination plans which can be incorporated into the unique plan you will be required to craft for your agency. As an example, you’ll need both a Hazardous Risk Assessment and a Communication Plan. Flood Risk Assessments from FEMA for your area may provide the specific information you will need to include in your own assessment. Your local agency may also help you develop a workable Communication Plan specifying how to get in touch with staff, patients, patient families and caregivers, as well as other facilities in the community in the event of a disaster which takes down phone and/or power lines, knocks out satellite communications and makes normal channels of communication impossible. Cross these 10 items off your To-Do List and you’ll already be 10 sizeable bites into the elephant as the calendar turns toward July, ushering in the revised Conditions of Participation. In a week of intense debate in the nation’s capital over efforts to repeal and replace Obamacare, the future of myriad home health regulations remains as uncertain as other health care issues. But one thing IS certain, according to Home Health Care Solutions owner J’non Griffin, who joined other home health experts at the 2017 Illinois Home Care and Hospice Conference & Exhibition near Chicago this week. Whether lawmakers change, repeal or leave in place existing Medicare requirements, agencies must continue to streamline their processes and focus on quality improvements to remain profitable in the increasingly challenging home health field. Agencies in Florida hoping for a reprieve from an April 1 rollout of pre-claim reviews by the Centers for Medicare and Medicaid Services are likely to be disappointed, according to keynote speaker William Dombi, who serves as The National Home Care Association’s Vice-President for Law. The eyes of the nation remain fixed on the D.C. debate over replacing the Affordable Health Care Act with an as-yet-unnamed plan which has been alternately dubbed Trumpcare, Ryancare and Obamacare Lite. How the proposed replacement would impact home health has not yet been determined. Meanwhile, the clock ticks inexorably toward the April 1 deadline in Florida, leaving little time or attention for NACH’s efforts to derail PCRs. NAHC has prioritized stopping the PCR process in additional states, including Florida, and curtailing the process in Illinois, which became the first state to undergo a PCR demonstration in August, 2016. Dombi said NACH is petitioning CMS to allow agencies which have had consistently high affirmation rates to opt out of the PCR process without being penalized financially. But NAHC’s efforts to get lawmakers to support the repeal of PCRs have been largely overshadowed by the bigger repeal efforts on Capitol Hill, and the political fallout. Republican lawmakers unveiled the replacement health care act promised by the Trump administration this week to major discord in Washington D.C., with condemnation from Democrats, the American Medical Association, the American Hospital Association, and even some Republicans. As federal lawmakers grapple with complex issues such as the extent of individual rights to health care, whether responsibility for health care is a federal or state priority and whether the role of the government in health care should be as partner or provider, Dombi sees some areas of hope on the horizon for home health. The new administration’s Secretary of Health and Human Services, Tom Price, has a sound grasp of many home health concerns and a history of support for many of them, Dombi said. Price has indicated some support for delaying new Conditions of Participation for Medicare which are scheduled to become effective July 13, Dombi said. The new CoPs will require many operational changes for home health agencies, and there is some concern within the industry that there is not enough time for agencies to fully implement all the changes. With no interpretive guidelines released four months away from the implementation, NAHC believes surveyors aren’t ready for new CoPs and has been lobbying for a delay. Word in D.C. is that Price is “seriously considering” NAHC’s position, according to Dombi. However, it is important to note that no delays of PCRs or CoPs have been approved at this time. Industry experts at the Illinois conference strongly encouraged agencies to proceed as if new Conditions of Participation, Pre-Claim Reviews and Value Based Purchasing initiatives (in which agencies are rewarded or penalized depending on how well they make improvements) are inevitable. No one knows if or when or where CMS will expand Value-Based Initiatives beyond the nine states in the current trial, whether PCRs will proceed to other states after the Florida rollout, or exactly what will happen next in home health, but agencies must be prepared anyway, PPS Plus educator Jennifer Warfield told her conference audience. “Even if the actual term Value Based Purchasing goes away, the future of your agency is always going to be tied to its improvement processes,” she said. Joyce Ryan Boin with Strategic Health Care Solutions encouraged agencies to redirect their focus toward education and ongoing strategy for measurable improvement. “We’re not in Kanas any more,” she said. EDITOR’S NOTE: Check out HHS Owner J’non Griffin’s four-part webinar series on the new Conditions of Participation, providing an overview and highlighting compliance strategies for agencies to develop a QAPI program. The series begins March 15 at 10:30 a.m. CT, and will continue March 29, April 11 and April 25. For details or to register, click here.